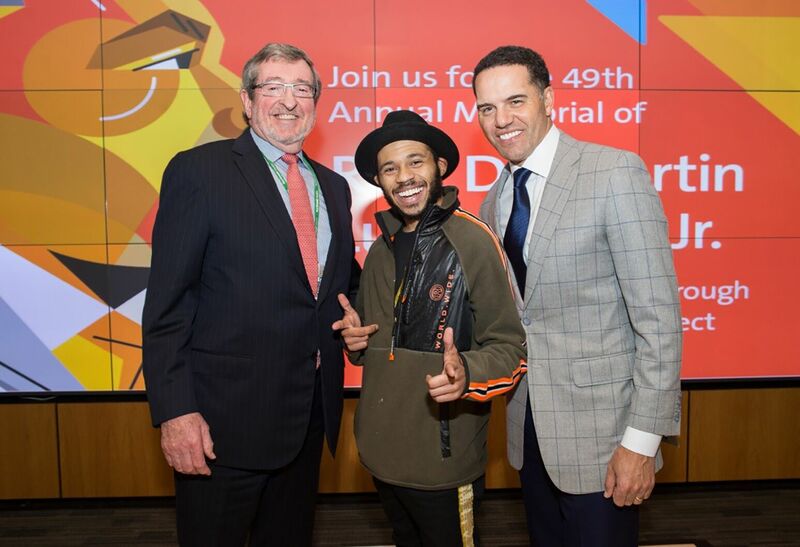 From left: Northwell Health President and CEO Michael Dowling with performer Cartier Williams and noted author/ motivational speaker Steve Pemberton, who served as keynote speaker for Northwell Health’s 49th annual Martin Luther King Day celebration. Michael Dowling calls Dr. Martin Luther King, Jr. a "unifier"
For the 49th consecutive year, employees of Northwell Health gathered together to honor the teachings and visions of Dr. Martin Luther King, Jr.
During his opening remarks at North Shore University Hospital (NSUH), Northwell President & CEO Michael J. Dowling referred to Dr. King as “a unifier” and encouraged the more than 400 people attendees – and hundreds of others watching remotely at 33 facilities across the health system – to “reflect on what we do day, and tomorrow, and all future tomorrows” in a communal effort to affect positive change. He also acknowledged Kenneth Gray, son of the late Bob McGhee, who started the health system’s first MLK Day event a half-century ago at NSUH. This year’s keynote speaker was Steve Pemberton, best-selling author, human resources executive and motivational speaker. His autobiographical book turned Netflix film, “A Chance in the World,” chronicles his beginnings as a foster child through an extraordinary life journey that led him to Boston College and to success in the corporate world. Currently, Mr. Pemberton serves as the chief human resources officer for Globoforce, a Massachusetts-based leading provider of social recognition and performance development solutions. His tireless advocacy for disenfranchised Americans has earned him many awards and recognitions, including the prestigious Horizon Award from the US Congress. Another highlight of the program was the award of the Rev. Dr.Martin Luther King, Jr. memorial program scholarship awards. Two high school students were each awarded $10K toward their four-year college education: Ayi Agboglo, a senior at Uniondale High School, who plans to attend Columbia University in the fall, and Magdalena Mazur, a senior at Jamaica Gateway to the Sciences, who is still considering her college options. Both students participate in the Medical Scholars Pipeline Program (MSPP) at the Zucker School of Medicine at Hofstra/Northwell. The program was created in 2010 to provide an educational pathway for students from medically underserved communities throughout the five boroughs of New York City and Long Island interested in health care careers. The program also featured choreographer, filmmaker and performer Cartier Williams, a self-described “hoofer” who performed an original tap dance depicting the quest for equality. Mr. Williams performed his work while images of the world’s most beloved civil rights advocates flashed behind him. Judging from the standing ovation, Mr. Williams’ work was a tremendous hit with the Northwell audience.